Is there any way to know what plots we are missing? Yes, there is an specific tool to support this functionality. Usually what happens is that the location of the plots being assessed is stored in different files ( each interpreter has been assigned an specific CSV file with plots to assess). Then it can be difficult to track which ones are left in order to finalize the assessment. To do so just go to Tools->Utilities->Find Missing plots in database. Then choose the files where the plot locations ( the CSV or CED files ) are stored, you can pick one or several files at the same time. After Collect Earth is done comparing the IDs of the plots in hte CSV files with the IDs of the plots that already are in the database you get a dialog with the results per file. Here it will tell you if a file is COMPLETE (no plots left to assess) or if there are any plots left (and their IDs). In the bottom you can see the information of the total number of plots in the CSV files that were chosen and how many plots are left. 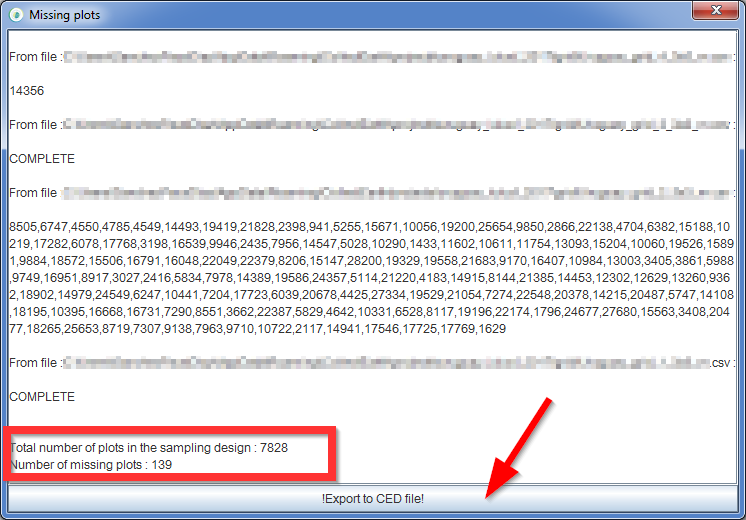 FINALLY AND VERY IMPORTANT : If you click on the "Export to CED" button on the bottom of the dialog you will obtain a CSV file that ONLY contains the plots that are missing from the database. This way you can get a CSV with only the plots that remain to finish in your assessment.